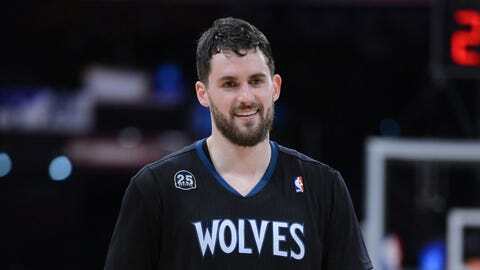 Power forward Kevin Love leads the Timberwolves with 25.9 points and 13.9 rebounds per game. MINNEAPOLIS — With a three-day Christmas break separating his team from the conclusion of an early-season gauntlet, Kevin Love feels there are about as many reasons to accept mediocrity left as there are days in 2014. Fatigue shouldn’t be an issue. Minnesota hasn’t played since Sunday, and its players were given Monday, Tuesday and Wednesday to rest up and enjoy the holiday before practicing Thursday afternoon. Can’t blame the schedule. Nine of the Timberwolves’ next 13 opponents have a losing record, presenting a prime opportunity to string wins together. Health is a concern, but a minor one — especially relative to this point last season, when players were already kept out of the lineup on a frequent basis. Less justification, Love says. More execution. "At some point," Love said, "we’ve got to be done with the excuses and just get over the hump." Love and his teammates’ Rick Adelman-granted respite this week — not unlike Ebenezer Scrooge giving Bob Cratchit Christmas Day off — was much needed after navigating the NBA’s third-toughest schedule to this point. Minnesota played eight back-to-backs — six in the season’s first months — and traveled to Mexico once, Los Angeles twice and Texas on three separate occasions. Adelman frequently bemoans the travel that comes with being a middle-America team in the Western Conference, which to boot is significantly outperforming the East two months into the season. But he can’t complain much about the next 3 ½ weeks. In addition to facing a handful of teams with significant issues of their own, the offense-centric, thus-far-shallow Timberwolves get Dallas, Oklahoma City and Phoenix at home. They play four of the league’s five teams that have yet to eclipse the nine-win mark, including Utah in back-to-back games Jan. 18 and 21. The last matchup commences an otherwise-taxing, four-game road swing that includes trips to Golden State, Portland and Chicago. If Minnesota isn’t able to make a run now, later may be too late. "You just keep going and you see if you can’t get on some streak," Adelman said. "It’s a combination of everybody getting a feel of ‘this is what we have to do.’ I don’t necessarily think it’s automatic that these guys or our team is what everybody thinks we should be at this point. I have to find a way — that’s my job — to find a way to make that happen and make them better as the season goes on." To be sure, a 13-15 mark just months removed from upgrading an already-potent roster that included Love (the league’s top rebounder and No. 3 scorer) point guard Ricky Rubio and center Nikola Pekovic is far from dazzling. Free-agent additions to the starting lineup Corey Brewer and Kevin Martin have proven both their worth and liability, at times starring and at others struggling. Behind those five, a lack of depth has Minnesota laboring to build or protect leads without running its starters into the ground. The bench turned a bit of a corner last week but is still missing a truly consistent punch. J.J. Barea could be that guy after appearing to recover from an early slump. So could either Brewer or Chase Budinger on the wing. Out since the beginning of the season with a meniscus injury, Budinger was cleared for full-contact practice last week and could be close to coming back. Either he or Brewer will be coming off the bench, depending what Adelman decides to do. Backup big man Ronny Turiaf appears to be inching closer to a return, too; Adelman said Thursday "he’ll be doing some contact, I think, in the next few days." Whenever he does suit up again, Turiaf should bolster the second unit’s defensive presence. But everyone else is relatively healthy. Their legs should be back under them. And they’re about to face a slate that, overall, is far from formidable. It sets up nicely. But so did losses to the same Wizards team Minnesota hosts Friday night, Cleveland and the Lakers and near misses against Orlando and Philadelphia. Chances to upset the Clippers, Spurs and Thunder all wilted in the fourth quarter, too. If the Timberwolves are to live up to preseason expectations and snap the NBA’s longest postseason drought, they can’t afford to fall much further behind. Especially during the upcoming turn of the calendar. "Just because somebody writes at the start of the season our goal is the playoffs — well, let’s figure it out as we go," Adelman said." It’s not gonna be the playoffs if we keep playing the way we’re playing right now."